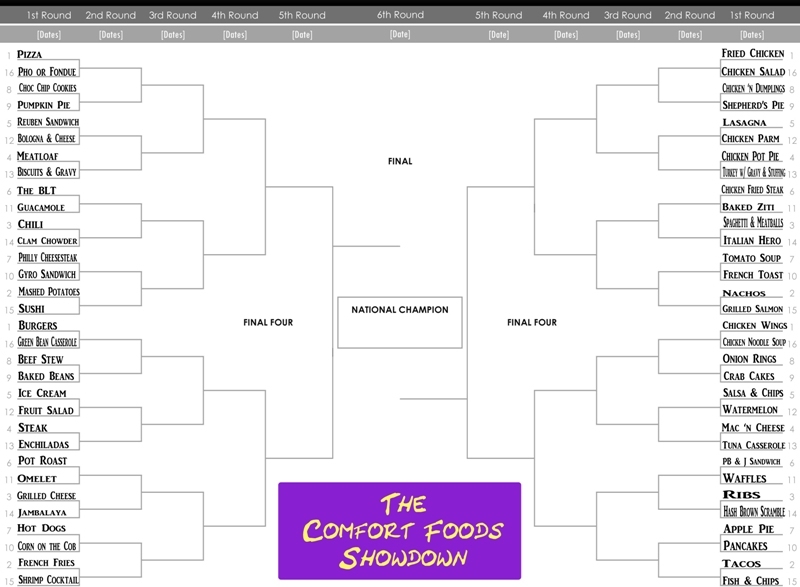 The Comfort Food Showdown is back! – I Love It Spicy! The Comfort Food Showdown is back! We did this interactive poll tournament back in 2011-12, and it was a lot of fun. We have 64 comfort foods to be determined via a poll in the main tournament. There will be a qualifying round which will pit Pho vs Fondue to see who gets the last spot. It will be a bit of practice for me, since it has been a very long time since I posted anything here. I just want to work out the kinks before we go to the main tournament votes. I think I will post each round with a corresponding poll each Sunday morning (Eastern Standard Time) before football kicks off. The poll will go 2-3 days depending on whether I close it promptly or not. The results will be seen once the poll is officially closed. So if you comeback you will be able to see how it went. This will be something I will post each week, and let it play out until a champion is declared. Remember to support your favorites or make sure the food you despise does not win. You know what happens when you leave the decision up to others? Anything can happen! Louisiana Style Hot Sauce Award goes to…wait it’s a tie!! !